Often, with the bad comes the good. Or the other way around. I received a rejection for one of my stories on Wednesday. Look, rejections happen. You can't be bitter about them and you can't let them stop you from writing. The first ones I got stung. I thought "they" were rejecting "me." I didn't realize there were opportunities to make my story better. I didn't recognize the writing quirks that stood in my way. You never quite grow numb to rejection, but you do become accustomed to it. To any writers out there feeling discouraged because your story/poem/book/memoir/query/article just got shot down, keep your chin up. Keep writing. Leonidas didn't give up. You shouldn't either. And it'll probably end better for you anyway. You know what happens when you keep at it? The next day you get an acceptance email for another story you submitted. That's exactly what happened to me today; I received an email from Pill Hill Press notifying me that my short story "And the World Stopped" made it into their Told You So anthology. To be perfectly honest, I didn't think that one was going to make it. The story is rather lengthy (8,300 words trimmed down from 8,600) and I wasn't sure its superhero vibe would fit in with the antho. Yet, it made it in and I'm waiting for the contract to firm up the deal. And the World Stopped: When the world's super-powered heroes and villains suddenly lose their awe-inspiring abilities, Night Wasp gets an unexpected call from the Heroic Legion to investigate. The vigilante's uncompromising effort uncovers a deep, wide-ranging conspiracy reaching to the highest levels and pitting him against his own government. I've updated the "Matt's Short Stories" section to reflect today's news. 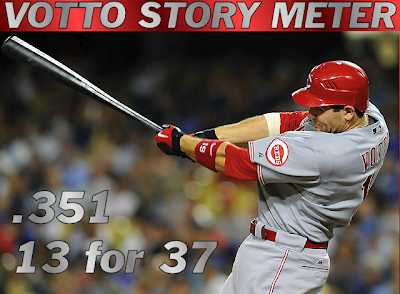 Even better, I've updated the fabled Votto Story Meter, which now includes Wednesday's rejection and Thursday's redemption. In real life, Joey Votto is hitting .335.